Volunteering Matters delivered 1 of the 3 Bristol Ageing Better Learning for Life Together projects funded by The Big Lottery. Older people (aged 50+) from the Hartcliffe, Bishopsworth and Withywood areas of Bristol were invited to share their skills, knowledge and experience of the local area over the past 100 years, firstly in reminiscence sessions, and then with a class of 7-9 year olds at nearby Four Acres Academy over 6 school visits. When 90 year old Hartcliffe resident Rose was approached to take part in a Bristol Ageing Better intergenerational learning project, she wasn’t keen on speaking directly with the children, so Volunteering Matters found a way for her to get involved on her terms. “I found out about the Learning for Life Together project through my friend Brenda. They were looking for people to go into Four Acres Academy and talk to the children about growing up in the local area. I thought it was a nice subject to talk about, but I was nervous about going into the school because I haven’t been amongst children like that for years. Jenny from Volunteering Matters came and recorded an interview with me. It was strange and interesting doing the interview because I haven’t spoken about the war for years and years. Brenda was telling me how much fun she was having at the school visits so I said I’d go along for the last one. 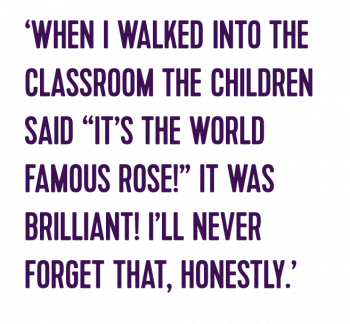 When I walked into the classroom the children said “It’s the world famous Rose!” It was brilliant! I’ll never forget that, honestly. I was a bit nervous when the teacher, Mr Knapper, started asking me questions in front of the class, but then the children read me what they’d written after listening to my interview and it was easier because they already knew a bit about me. I think they’ll realise what we went through during the war; that sunk in quite well. They learned about the different foods we used to eat, food that isn’t around now. I learned a bit from going to the school. The children were really interested in it, they took everything in. I thought they were great, they were lovely and really interesting to listen to. I would have gone before if I’d have known what it was going to be like.